Miriam Jones (University of Alaska, Fairbanks) along with graduate students Erik Klein and Chris Bochicchio (Lehigh University) spent two weeks last August exploring ancient peat bogs in western and southwestern Alaska, for a National Science Foundation-funded study led by principal investigator Zicheng Yu (Lehigh). Yu, Jones and colleagues hope to use peat cores to reconstruct the extent of Alaskan peatlands during the Holocene Thermal Maximum (HTM), a time of warmer climate between 10,000 and 12,000 years ago. The HTM was a time of peatland expansion and accumulation in Alaska, particularly on the North Slope and south-central Alaska. This expansion is confusing, Jones says, because peatlands ordinarily shrink during periods of warmer and drier climate as water sources dry up and wetlands are overtaken by deciduous forest vegetation. During the early Holocene, Alaskan peat accumulation rates were four times higher than during the rest of the Holocene, which may mean that seasonal factors like lots of rain during summer months contributed heavily to the HTM expansion. Peat is a soil type containing at least 90% organic matter. The spongy stuff forms where vegetation accumulates faster than it decomposes, particularly in acidic, anaerobic wetlands dominated by Sphagnum mosses, which are resistant to decay. Peatlands represent large accumulations of carbon in the form of plant material. Today, about 1/3 of all carbon contained within the world’s soils is stored in present and ancient peat reservoirs. 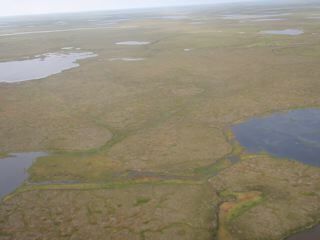 Only a small percentage of peatlands are in areas with permafrost (the Seward Peninsula being one example), but, during times of rapid peatland expansion, Jones says, carbon accumulates quickly in these regions where it remains stored in permafrost until warmer climates thaw the permafrost and release the carbon back into the atmosphere. The effects of the sudden carbon release in the form of methane gas may have important consequences to an already warming climate. Peatlands tend to concentrate in the higher latitudes of both northern and southern hemispheres, but are also found in warmer climates (as in Florida’s Everglades). Peat formation is controlled by physical factors such as basin geomorphology, hydrology, and climate. In Alaska, peatlands often form in areas of permafrost where the topography concentrates precipitation and in thermokarst regions, the lumpy, marshy ground that forms when large areas of permafrost thaw. 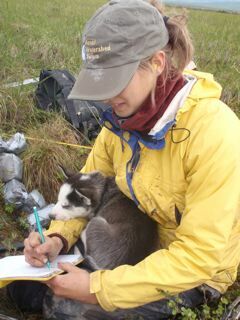 The group cored in both permafrost and thermokarst environments on the Seward Peninsula, along the Niukluk River east of Nome, in the flats near Council and along the road to Kougarok. They also described vegetation in 1x1 meter plot surveys, describing the plants on the surface for comparison to fossilized plants found in the old peat. The team took permafrost cores using (what else?) a permafrost core drill. In preparation for drilling, Jones first clears the active layer, the top part of the soil that freezes in winter and thaws in the summer. Once she reaches the permafrost layer, Jones readies her drill–a chain saw motor attached to a tube which holds a diamond-tipped drill bit. Slowly and carefully, she drills in and pulls out core in half-meter sections, careful to not let any warm air into the hole where it will freeze and cause the bit to stick. Drilling in thermokarst can be trickier, Jones says, particularly if the peat is wet and soft. It requires a “Russian-style” drill with a pointy tip that the operator manually drives to a desired depth. At that point, a chamber opens, scrapes the surrounding soil, and brings it back up to the surface. Then it’s wrap ‘em up and fly ’em out.